When William McKinley won the presidential election in November 1896, the question of Hawaii's annexation to the U.S. was again opened. The previous president, Grover Cleveland, was a friend of Queen Liliʻuokalani. He had remained opposed to annexation until the end of his term, but McKinley was open to persuasion by U.S. expansionists and by annexationists from Hawaii. He agreed to meet with a committee of annexationists from Hawaii, Lorrin Thurston, Francis Hatch and William Kinney. After negotiations, in June 1897, McKinley agreed to a treaty of annexation with these representatives of the Republic of Hawaiʻi. The president then submitted the treaty to the U.S. Senate for approval. Despite some opposition in the islands, the Newlands Resolution was passed by the House June 15, 1898, by a vote of 209 to 91, and by the Senate on July 6, 1898, by a vote of 42 to 21, annexing Hawaii as a U.S. territory. Its legality continues to be questioned because it was a United States Government resolution, not a treaty of cession or conquest as is required by international law. Both houses of the American Congress carried the measure with two-thirds majorities. In 1900, Hawaii was granted self-governance and retained ʻIolani Palace as the territorial capitol building. Though several attempts were made to achieve statehood, Hawaiʻi remained a territory for sixty years. Plantation owners and key capitalists, who maintained control through financial institutions, or "factors," known as the Big Five, found territorial status convenient, enabling them to continue importing cheap foreign labor; such immigration was prohibited in various states of the U.S. The power of the plantation owners was finally broken by activist descendants of original immigrant laborers. Because they were born in a U.S. territory, they were legal U.S. citizens. Expecting to gain full voting rights, they actively campaigned for statehood for the Hawaiian Islands. When the Hawaiian islands were formally annexed by the United States in 1898, the event marked end of a lengthy internal struggle between native Hawaiians and white American businessmen for control of the Hawaiian government. In 1893 the last monarch of Hawaii, Queen Lili'uokalani, was overthrown by party of businessmen, who then imposed a provisional government. Soon after, President Benjamin Harrison submitted a treaty to annex the Hawaiian islands to the U.S. Senate for ratification. In 1897, the treaty effort was blocked when the newly-formed Hawaiian Patriotic League, composed of native Hawaiians, successfully petitioned the U.S. Congress in opposition of the treaty. The League's lobbying efforts left only 46 Senators in favor of the resolution, less than the 2/3 majority needed for approval of a treaty. The League's victory was shortlived, however as unfolding world events soon forced the annexation issue to the fore again. With the explosion of the U.S.S. Maine in February of 1898 signaling the start of the Spanish American War, establishing a mid-Pacific fueling station and naval base became a strategic imperative for the United States. The Hawaiian islands were the clear choice, and this time Congress moved to annex the Hawaiian islands by Joint Resolution, a process requiring only a simple majority in both houses of Congress. On July 12, 1898, the Joint Resolution passed and the Hawaiian islands were officially annexed by the United States. The Hawaiian islands had a well-established culture and long history of self-governance when Captain James Cook, the first European explorer to set foot on Hawaii, landed in 1778. The influence of European and American settlers quickly began to alter traditional ways of life. Originally governed by individual chiefs or kings, the islands united under the rule of a single monarch, King Kamehameha, in 1795, less than two decades after Cook's arrival. Later the traditional Hawaiian monarchy was overthrown in favor of a constitutional monarchy. Eventually, the monarchy itself was abandoned in favor of a government elected by a small group of enfranchised voters, although the Hawaiian monarch was retained as the ceremonial head of the government. Even elements of daily life felt the social and economic impact of the white planters, missionaries and businessmen. The landholding system changed, and many aspects of traditonal culture were prohibited including teaching the Hawaiian language and performing the native Hula dance. In 1887, the struggle for control of Hawaii was at its height as David Kalakaua was elected to the Hawaiian throne. King Kalakaua signed a reciprocity treaty with the United States making it possible for sugar to be sold to the U.S. market tax-free, but the haole - or "white" - businessmen were still distrustful of him. They criticized his ties to men they believed to be corrupt, his revival of Hawaiian traditions such as the historic Hula, and construction of the royal Iolani Palace. A scandal involving Kalakaua erupted in the very year he was crowned, and it united his opponents, a party of businessmen under the leadership of Lorrin Thurston. The opposition used the threat of violence to force the Kalakua to accept a new constitution that stripped the monarchy of executive powers and replaced the cabinet with members of the businessmen's party. The new constitution, which effectively disenfranchised most native Hawaiian voters, came to be known as the "Bayonet Constitution" because Kalakaua signed it under duress. When King Kalakaua died in 1891, his sister Lili'uokalani succeeded him, and members of the native population persuaded the new queen to draft a new constitution in an attempt to restore native rights and powers. The move was countered by the Committee on Annexation, a small group of white businessmen and politicians who felt that annexation by the United States, the major importer of Hawaiian agricultural products, would be beneficial for the economy of Hawaii. Supported by John Stevens, the U.S. Minister to Hawaii, and a contingent of Marines from the warship, U.S.S. Boston, the Committee on Annexation overthrew Queen Lili'uokalani in a bloodless coup on January 17, 1893 and established a revolutionary regime. Without permission from the U.S. State Department, Minister Stevens then recognized the new government and proclaimed Hawaii a U.S. protectorate. The Committee immediately proclaimed itself to be the Provisional Government. President Benjamin Harrison signed a treaty of annexation with the new government, but before the Senate could ratify it, Grover Cleveland replaced Harrison as president and subsequently withdrew the treaty. Shortly into his presidency, Cleveland appointed James Blount as a special investigator to investigate the events in the Hawaiian Islands. Blount found that Minister Stevens had acted improperly and ordered that the American flag be lowered from Hawaiian government buildings. He also ordered that Queen Lili'uokalani be restored to power, but Sanford Dole, the president of the Provisional Government of Hawaii, refused to turn over power. Dole successfully argued that the United States had no right to interfere in the internal affairs of Hawaii. The Provisional Government then proclaimed Hawaii a republic in 1894, and soon the Republic of Hawaii was officially recognized by the United States. The overthrow of Lili'uokalani and imposition of the Republic of Hawaii was contrary to the will of the native Hawaiians. Native Hawaiians staged mass protest rallies and formed two gender-designated groups to protest the overthrow and prevent annexation. One was the Hui Hawaii Aloha Aina, loosely translated as the Hawaiian Patriotic League, and the other was its female counterpart, the Hui Hawaii Aloha Aina o Na Wahine. On January 5, 1895, the protests took the form of an armed attempt to derail the annexation but the armed revolt was suppressed by forces of the Republic. The leaders of the revolt were imprisoned along with Queen Lili'uokalani who was jailed for failing to put down the revolt. In March of 1897, William McKinley was inaugurated as President of the United States. McKinley was in favor of annexation, and the change in leadership was soon felt. On June 16, 1897, McKinley and three representatives of the government of the Republic of Hawaii --Lorrin Thurston, Francis Hatch, and William Kinney-- signed a treaty of annexation. President McKinley then submitted the treaty to the U.S. Senate for ratification. The Hui Aloha Aina for Women and the Hui Aloha Aina for Men now organized a mass petition drive. They hoped that if the U.S. government realized that the majority of native Hawaiian citizens opposed annexation, the move to annex Hawaii would be stopped. Between September 11 and October 2, 1897, the two groups collected petition signatures at public meetings held on each of the five principal islands of Hawaii. 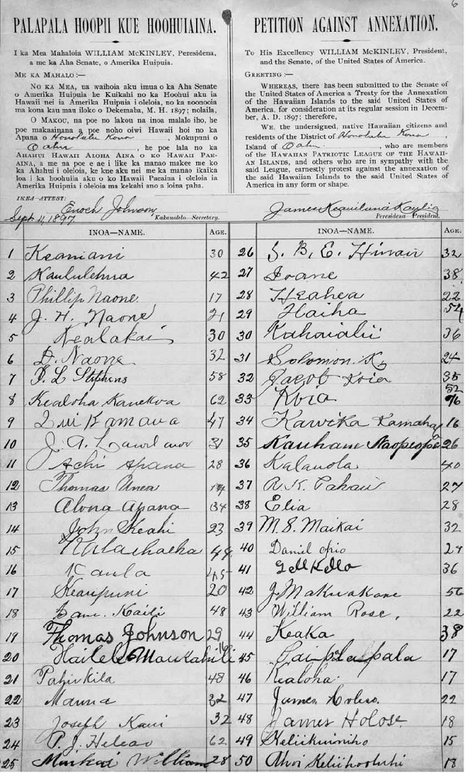 The petition, clearly marked "Petition Against Annexation" and written in both the Hawaiian and English languages, was signed by 21,269 native Hawaiian people, or more than half the 39,000 native Hawaiians and mixed-blood persons reported by the Hawaiian Commission census for the same year. Four delegates, James Kaulia, David Kalauokalani, John Richardson, and William Auld, arrived in Washington, DC on December 6 with the 556-page petition in hand. That day, as they met with Queen Lili'uokalani, who was already in Washington lobbying against annexation, the second session of the 55th Congress opened. The delegates and Lili'uokalani planned a strategy to present the petition to the Senate. The delegation and Lili'oukalani met Senator George Hoar, chairman of the Senate Committee on Foreign Relations on the following day, and on December 9, with the delegates present, Senator Hoar read the text of the petition to the Senate. It was formally accepted. The next day the delegates met with Secretary of State John Sherman and submitted a formal statement protesting the annexation to him. In the following days, the delegates met with many senators, voicing opposition to the annexation. By the time the delegates left Washington on February 27, 1898, there were only 46 senators willing to vote for annexation. The treaty was defeated in the Senate. Other events brought the subject of annexation up again immediately. On February 15, 1898, the U.S. Battleship Maine was blown up in Havana harbor in Cuba. The ensuing Spanish-American War, part of which was fought in the Philippine Islands, established the strategic value of the Hawaiian islands as a mid-Pacific fueling station and naval installation. The pro-annexation forces in Congress submitted a proposal to annex the Hawaiian Islands by joint resolution, which required only a simple majority vote in both houses. This eliminated the 2/3 majority needed to ratify a treaty, and by result, the necessary support was in place. House Joint Resolution 259, 55th Congress, 2nd session, known as the "Newlands Resolution," passed Congress and was signed into law by President McKinley on July 7, 1898. Once annexed by the United States, the Hawaiian islands remained a U.S. territory until 1959, when they were admitted to statehood as the 50th state. The story of the annexation is a story of conflicting goals as the white businessmen struggled to obtain favorable trade conditions and native Hawaiians sought to protect their cultural heritage and maintain a national identity. The 1897 Petition by the Hawaiian Patriotic League stands as evidence that the native Hawaiian people objected to annexation, but because the interests of the businessmen won out, over the coming decades most historians who wrote the history of Hawaii emphasized events as told by the Provisional Government and largely neglected the struggle of the Native Hawaiians. Today, there is a growing movement on the Islands to revive interest in the native Hawaiian language and culture. Primary sources such as this petition bear witness that there is another side to the story. The annexation petition with its voluminous signatures, along with many related records, is filed in the Records of the U.S. Senate, Record Group 46, at the National Archives and Records Administration. The petitions are available on microfilm as publication M1897.